Making buttons with your Hand Press is easy! Here's a quick 1-minute video that shows you how to make your own pin-back buttons with our Hand Press. Looking for a bit more instruction? This 3-minute video offers an in-depth look into making a button with our Hand Press. 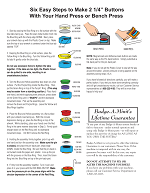 For printed instructions, click this link to view our Hand Press Instructions PDF. View the button-making process for our Badge-A-Minit Semi-Automatic machines by clicking on the links below. You will view a step-by-step video demonstrating how the machine assembles a button using 2¼" badge parts. The video is less than 2 minutes long and will prove to be a helpful guide in the semi-automatic process. The 2¼" machine is used but, PLEASE NOTE that the 1¼" and 3" semi-automatic machines work in the same manner. Please call our customer service if you have any additional questions at 800.223.4103!